Hemlock woolly adelgid has been present in New York for over 20 years, and new infestations continue to be found each year. Since eradication is no longer possible, infestation management is the only available course of action. As such, it is critical to manage HWA populations to preserve the genetic diversity of our hemlock trees and the ecosystem services that they provide. A current map of HWA locations can be found on the DEC website here. Forests are a defining part of New York’s landscape, and HWA threatens a critical piece of our forest communities. According to the DEC, nearly 19 million acres of New York’s land is forest, and 76% of that forested land is privately owned. Forest landowners play a vital role in slowing the spread of HWA throughout the state by monitoring and treating hemlocks on their lands. Management for HWA has been approached in two ways: application of systemic insecticides for short-term management and through the development of biological controls for long-term management. Our HWA biocontrol lab based at Cornell University is focused on researching HWA management through insect predators, with the goal of permanent limitation of HWA to a minor tree pest. This work is still in the research stage, and it will take several years for these methods to become available to the public. In the meantime, focusing management efforts on traditional treatment methods can save trees in the short term, ensuring that hemlocks will persist in our forests until biocontrols are widely available. Detailed information on landowner management and treatment of HWA is available on our landowner management page. For a list of all available treatment methods and current Best Management Practices, you can visit our HWA Treatment Options page. Certified Applicators are a great resources for landowners when it comes to planning HWA management on their properties. Applicators are encouraged to visit our HWA Treatment Options and Imidacloprid Information pages, which have information on available application methods and dosage information. Applicators should also be aware that applying Imidacloprid or Dinotefuran as a basal bark application requires a 2ee exemption. 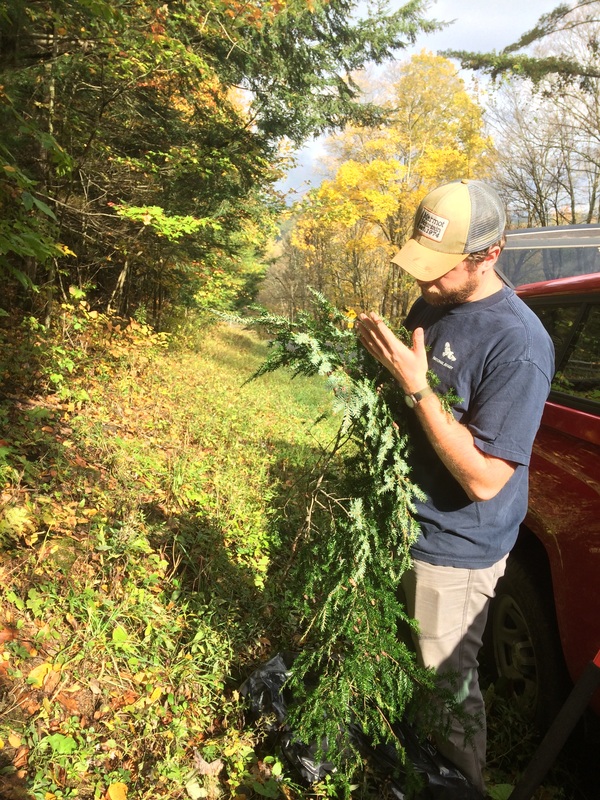 We frequently receive questions regarding local hemlock treatments and are currently compiling a list of applicators from around the state that provide resources for inquiring landowners. If you are part of a business or are a private contractor that treats hemlocks with imidacloprid and/or dinotefuran and you would like to be added to our list, please get in touch with us. You can submit your name, business name if applicable, contact information (phone, email, website, etc. ), and a list of counties you serve to nyshemlockinitiative@cornell.edu. Above, Right: These presentations were originally given by Mark Whitmore for Cornell’s ForestConnect program.